"Missouri's "lead institution in professional technology" is located in Warrensburg, a hamlet of about 15,000 residents, located 50 miles from Kansas City. Pre-professional programs in management, agriculture, and other technology-heavy areas are a very big focus here. The athletic team mascots are the Mules and the Jennies, for men's and women's teams respectively." Describe the type of student who should not attend University of Central Missouri and explain why. Describe the type of student who should attend University of Central Missouri. Why? What is a typical University of Central Missouri student like? Describe the type of person that should attend University of Central Missouri. A typical University of Central Missouri student is a person who is driven to work hard to be successful. Everyone is friendly and welcomes diversity. What are the top 3 reasons someone should attend University of Central Missouri? What was a typical University of Central Missouri student like in high school? Describe the type of person that should attend University of Central Missouri. The type of person that should attend UCM should know what field of study they want. They should also have goals set to achieve each semester. Why do nearly 12,000 undergraduate and graduate students Choose Red? Perhaps it is because they can choose from 150 career-building programs of study. Maybe it's the outstanding faculty. It could be the beautiful residential campus or the welcoming hometown atmosphere of Warrensburg. Others Choose Red to compete or cheer for the Mules and Jennies, one of NCAA-Division II's most successful intercollegiate athletics programs. For these and countless other reasons, students from across the state and around the globe find the University of Central Missouri the perfect choice for their educational goals. 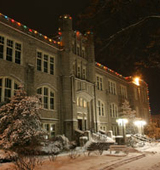 UCM was founded in 1871 as a normal school for teacher preparation. Central Missouri remains committed to preparing our students to excel as they enter the professional world as the teachers, business professionals, scientists, artists and aviators of tomorrow. Success at UCM translates to success in the professional setting. Our six-month job-placement rate for undergraduates is 92 percent, and, reflecting our excellent financial support packages, our students benefit from one of the lowest student-debt ratios in the state. Publicly supported, richly diverse in our people and programs, UCM offers a remarkable educational experience. Questions? Please contact us. Better yet, come for a visit. What are the top 3 things that students do for fun at University of Central Missouri? The great thing that students do find fun is, watching movies. I love it a lot. Generally I prefer free movie sites to watch all latest movies and TV Shows for free. You can also download movies on these applications. The average student pays $13,842 for tuition, fees, and other expenses, after grants and scholarships. Total stated tuition is $6,395, in-state and on-campus, before financial aid. Learn more about financial aid at http://www.ucmo.edu/sfs. Estimate the net price for you at http://www.ucmo.edu/calcs/. The typical (median) early career salary of University of Central Missouri graduates is $39,900, according to Payscale. University of Central Missouri participates in the NCAA Division II for college athletics. is the school a private or public school? University of Central Missouri is a public school, but it is not a part of Missouri's state school system.